Sarah Sums It Up | Keeping it simple and summing it up one post at a time. Reading and agriculture have always been a daily part of my life. Growing up my mother always read to me. 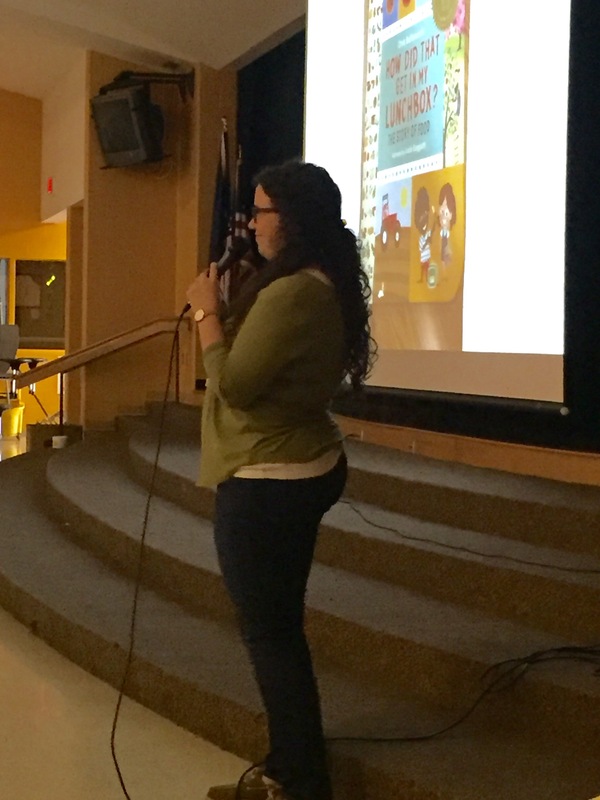 She instilled a love for reading and education that has stayed with me into my adult life and professional career. My farmer father, planted my passion for agriculture in me that has also helped me attain some of my personal and professional goals. Those goals lead me to become a teacher and an active advocate for agriculture in my community. I am a teacher at Monrovia Elementary School and a first year Morgan County Fair Board member. One of the many reasons I wanted to join the board was to use my experience in education to help promote agriculture to the general public. I saw the county fair as a perfect platform to present agriculture education materials. With this goal in mind, I presented an idea to the board to incorporate reading and agriculture, Agriculture Storybook Time. This idea is much like the storybook events that happen at your local libraries or bookstores where children gather around to listen to someone read a story. This new event will take place at the Morgan County Fair (July 29 – Aug. 6) everyday on the Free Stage. There will be two opportunities to hear stories about agriculture at 11:00 a.m. and 5 p.m. A different book about agriculture will be read each time by a volunteer from the community. These are some of the books that will be read. As a lifelong member of Morgan County and 10 Year 4-H Member, I have attended the Morgan County fair since I was a baby. As the years have passed, I have noticed the need for more educational events for small children and their families to participate in during the fair. Agriculture Storybook Time gives children and their families an opportunity to do something at the fair as a family and to participate in an agricultural education experience. Studies have shown the importance of reading to a child for at least 20 minutes a day and the great impact it can have on a child’s development. Reading and/or listening to someone else read helps children’s brain and literacy skills develop. With the busy schedules families have today, it is hard to get in that special reading time especially during the summer months. Agriculture Storybook Time will create an opportunity for children to get this important reading time. 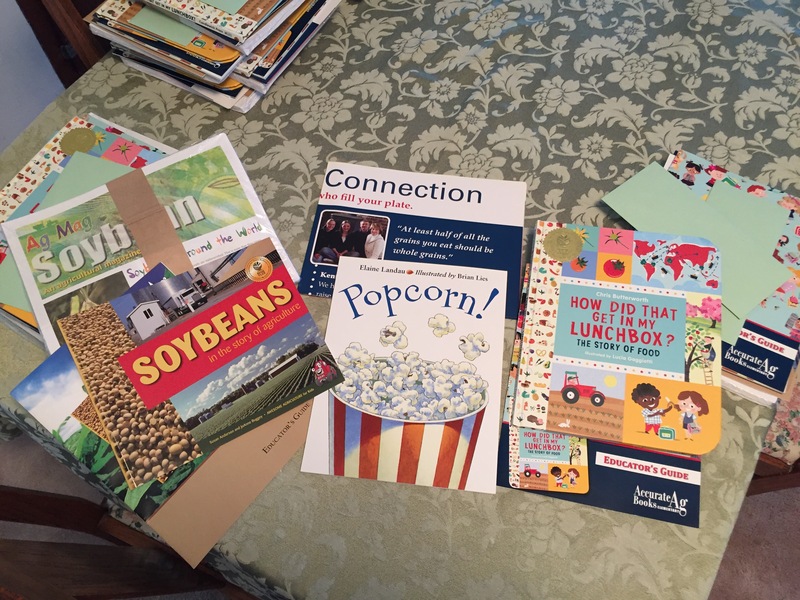 In addition to receiving the recommended 20 minutes of reading, children will learn about agriculture and what farmers do on their farms through the books I have selected to be read during Agriculture Storybook Time. Every child and their family members are consumers, but many are so far removed from the farm and where their food comes from they don’t understand the work farmers are doing for them. This opportunity will help bridge the gap between consumers and our farmer producers. To sum it up, I encourage you to attend our Morgan County Fair (July 29 – Aug 6) and stop by the Free Stage at 11:00 a.m. and/or 5:00 p.m. for Agriculture Storybook Time. I hope you enjoy this special reading time with your family while learning something I am very passionate about, agriculture! March is my favorite month of the year. I love to see everything come to life after it’s long winter rest. I love seeing new life on the farm. I also love seeing my family and other farmer friends prepare for the planting season. To me, January is not for new beginnings, March is. I also love the month of March because it’s Agriculture Appreciation Month and there is nothing I enjoy more than educating, promoting, AGvocating, and appreciating farmers and all their hard work they do for me. This year to celebrate those hands that feed us, my sister, mother, and I donated books about agriculture to all of the elementary school libraries in our home county of Morgan County. We donated them in memory of my father, Tim Thomas, who passed away in a farming accident 6 years ago. Our hope is for the librarians, teachers, and students to use these books to help educate their students and/or themselves about the importance of agriculture and farmers. I enjoyed picking out the books and educator guides we donated. It was so hard to only donate a couple! 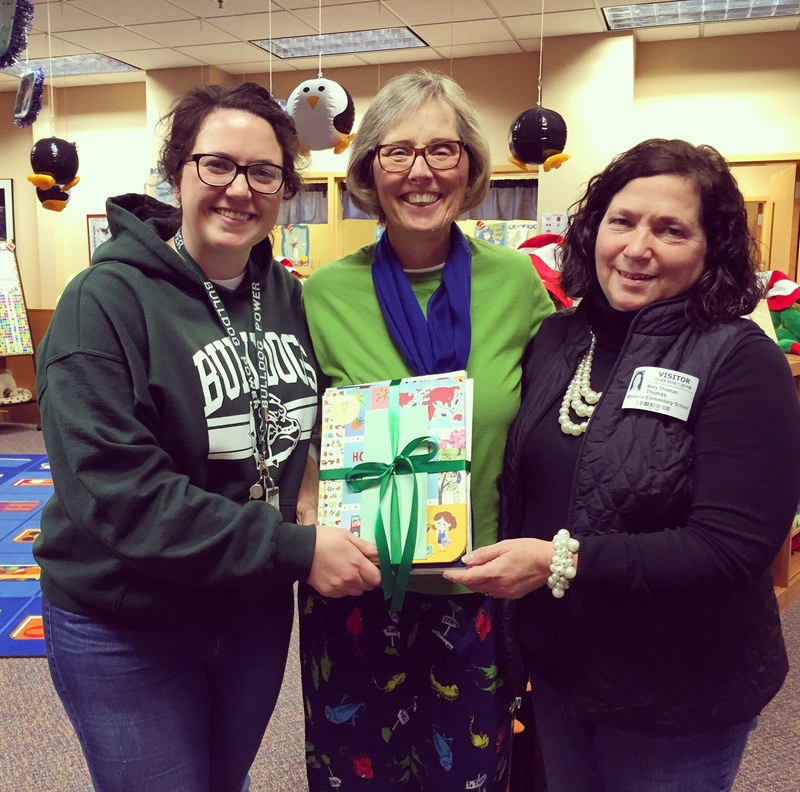 So, my sister, mom, and I decided we will continue to donate and grow the ag book bundles for each library in Morgan County in the years to come. As a teacher I have many opportunities to teach my students about agriculture. 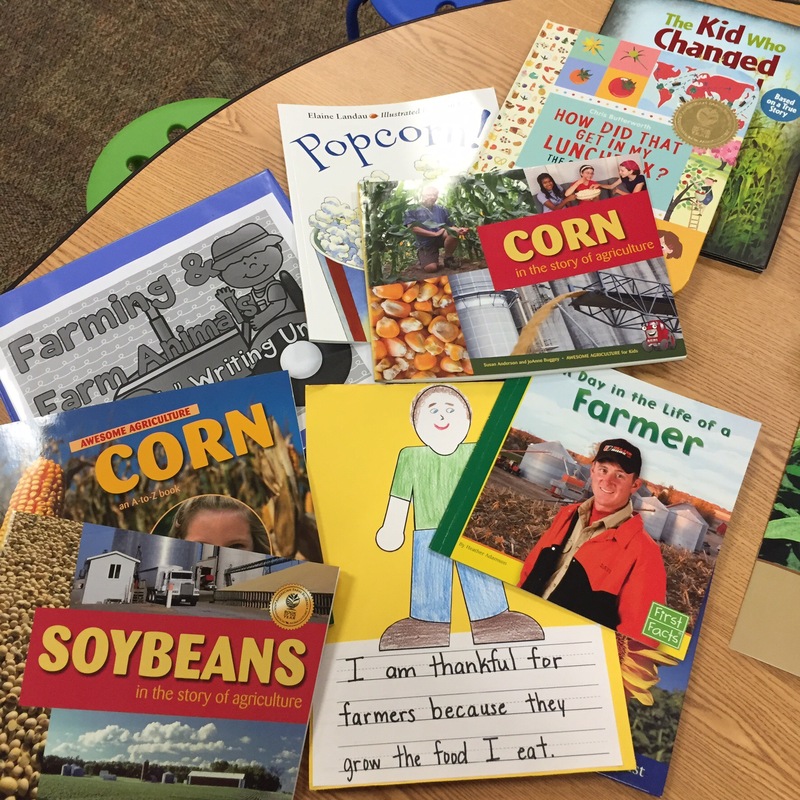 Throughout “Ag Week” (March 14-18) I read many books about farmers, farming, and ag products to help my students understand what farmers do for them and how they get their food and other products they need to live. 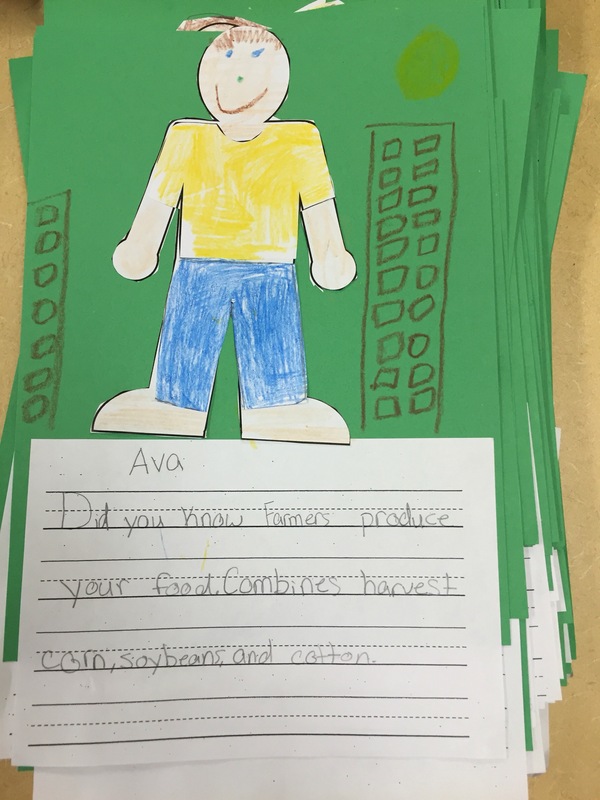 After we read the books and watched MANY Peterson Farm Brothers videos we brainstormed and wrote down facts about farmers and farming on our planning sheets. 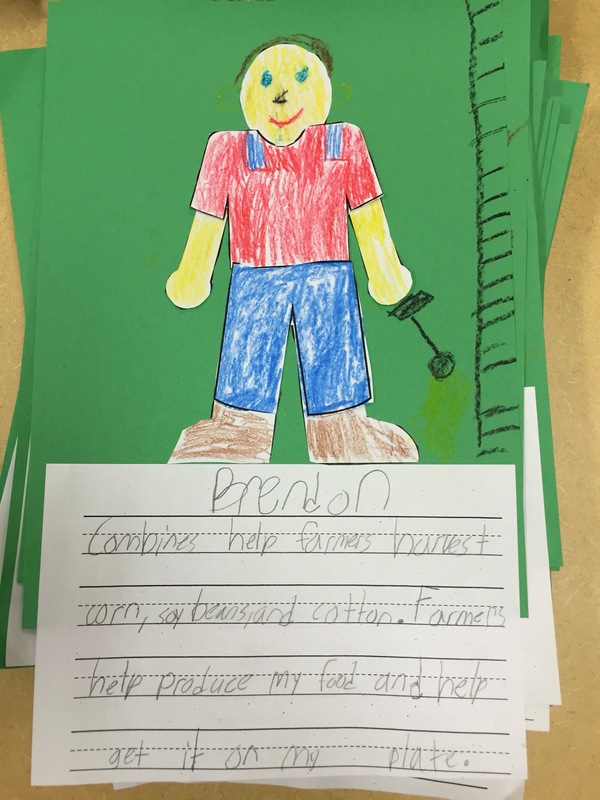 Then, my students took their notes to write sentences about farmers. 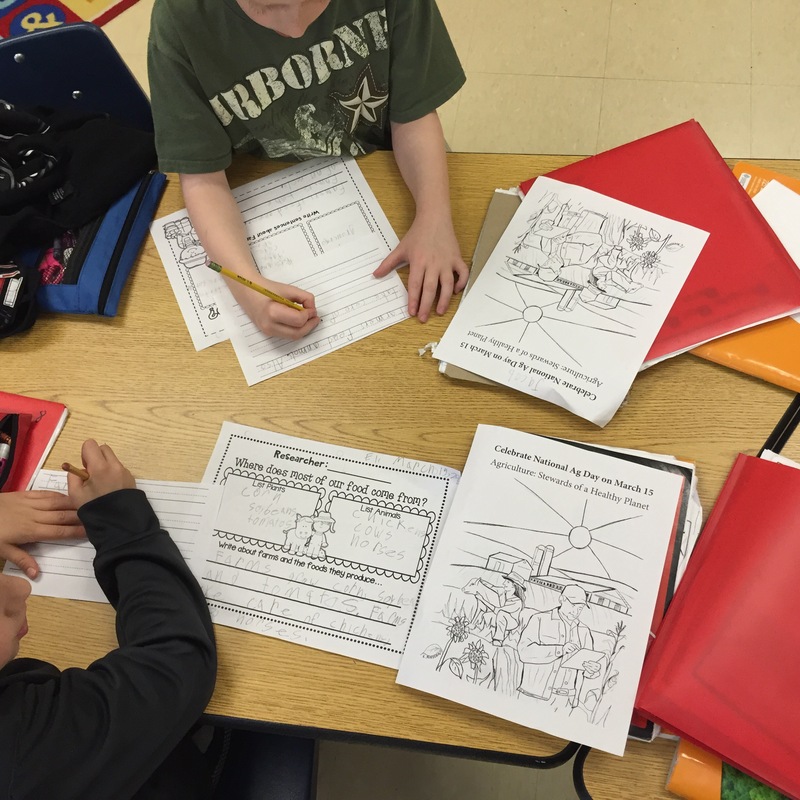 After their writing was complete I let them create their own farmers. My students had so much fun doing this! 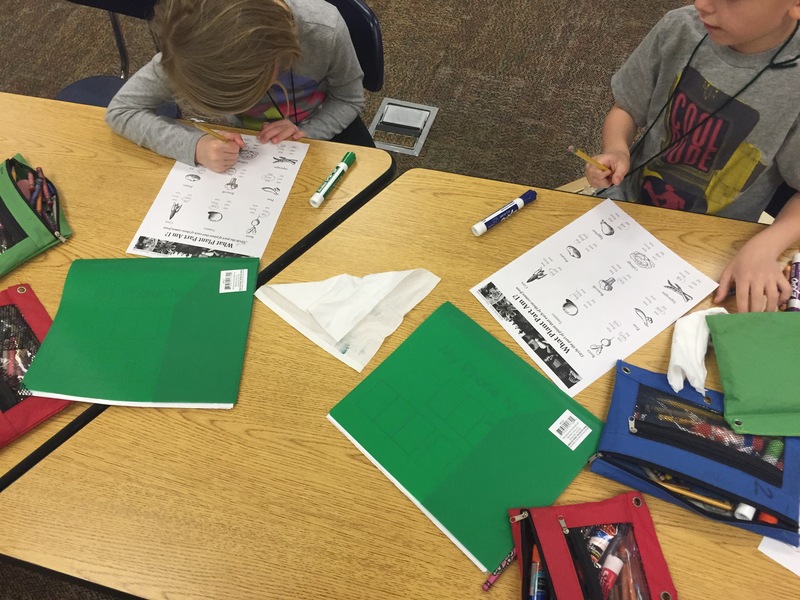 I did a lesson on seeds and plants with my kindergarten class. We read books about what all seeds need to grow for them to turn into the plants we eat. Then we made seed necklaces. 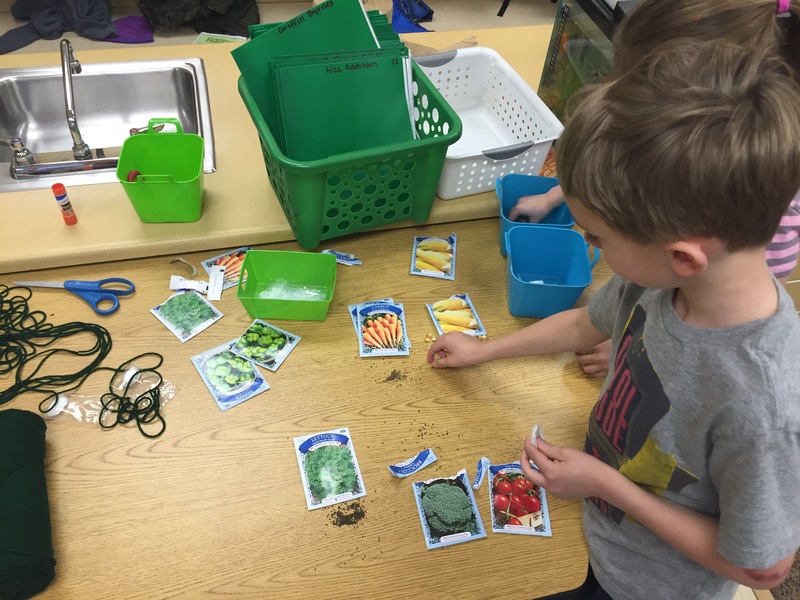 This was a fun way for them to learn about seeds and then take their seed home and plant it if they wish. 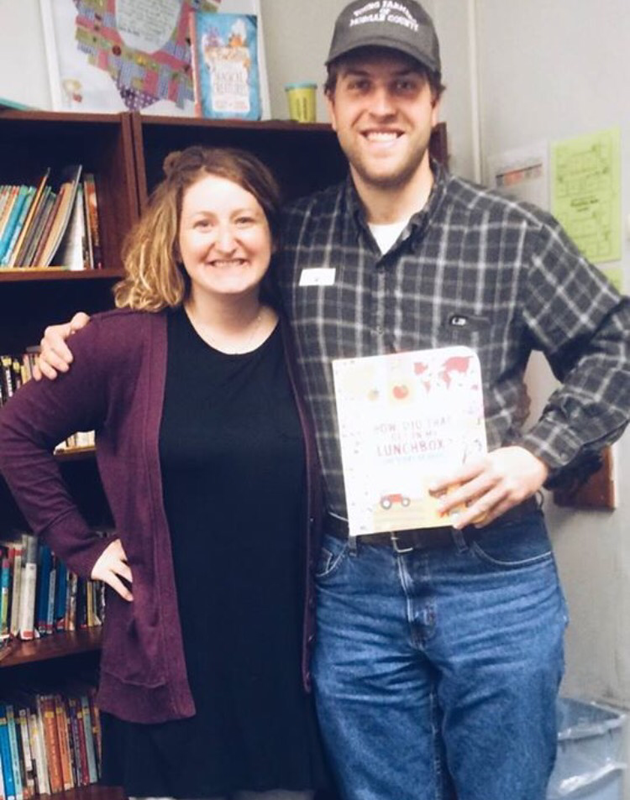 As a member of the Morgan County Young Farmers I helped some of our young farmers go into classrooms in our county to read agriculture books to students. Our president, Patrick Maxwell, visited a school in Mooseville’s school district. 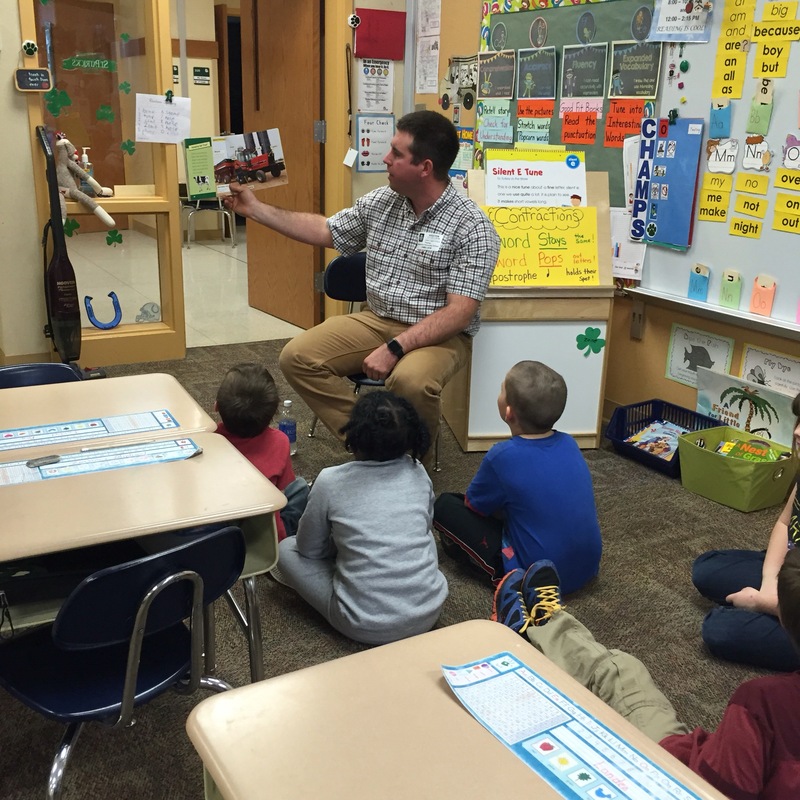 He read to his cousin’s students. 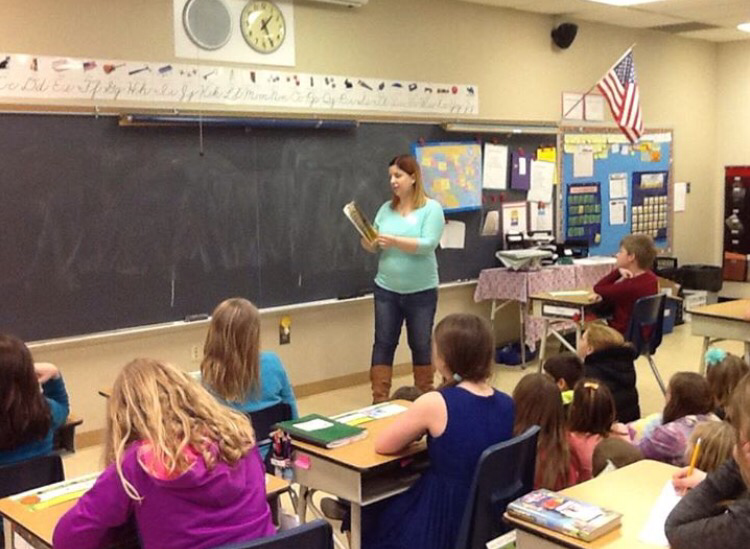 Our secretary, Maggie Voyles, visited South Elementary, a school in Martinsville’s school district. Joe Cleveland, our treasurer visited Monrovia Elementary school and member, Wayne Vaught, visited Eminence Elementary. 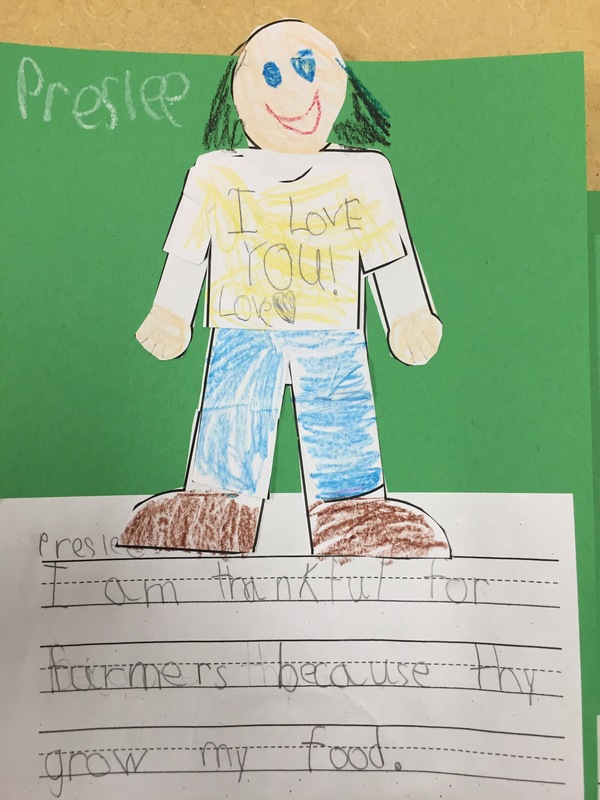 Together our young farmer group reached every school district in our county to help educate students about ag. I was so proud of our young farmers for doing this and I hope to plan more visits to schools in our county for our members. At my school, Monrovia Elementary School, I planned an Agriculture Appreciation convocation. All of the students in my school building came to the gym. There I gave a quick little speech about famers and farming and why it is important we know what they do and to thank them every chance we get. Then, my principal, Mrs. York, read How Did That Get in my LunchBox? This book was one of the books we donated in honor of my Dad. 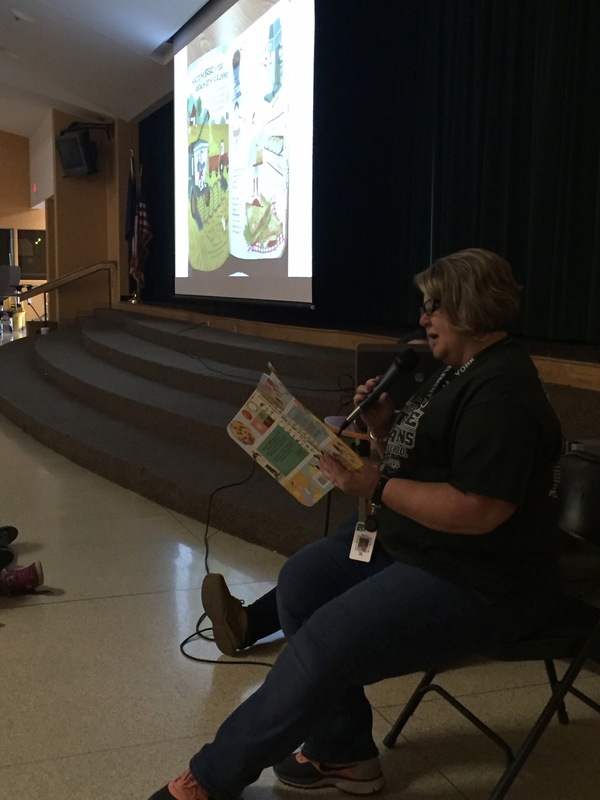 I also made a power point of the pages so our students could see the colorful book pages as Mrs. York read aloud. When she finished reading I played the Peterson Farm Brothers’ video, I’m so Farmer. The students and staff absolutely loved the songs and message! This month I also cowrote an article with my sister, Katie, about women in agriculture that was published in our local newspaper. I love writing with my sister. Agriculture has connected us in such a unique way and we love sharing our writing on our blogs and in our hometown publication. To sum it up, March provides opporutinties for me to share the story of agriculture. Please say a prayer for farmers as the prepare for the busy planting season. Pray for safe travel to and from the fields. Pray for good weather to get the crop in the ground. And always, always praise and be thankful for their hard work. Do your part to appreciate agriculture and thank a farmer. It’s the “Year of the Farmer” at the great Indiana State Fair and we are so excited that our favorite people and their hard work they do for each one of us will be featured. Honestly, every year is the “year of the farmer” because without them there would be nothing to showcase at the county and state fairs or growing in the many farm fields throughout the country. There would be no animals that 4­-H members raised or selected from a farm for their projects. There would be no fair food that has everyone marking their calendars for when they get to put their hands around a delicious tenderloin sandwich or pork burger. Or an ear of buttery sweet corn that you know will get stuck in your teeth, but honestly don’t care because it happens to everyone! The Indiana State Fair dates are August 7 – 23. A farmer or a farm family that represents different components of Indiana agriculture will be featured every day at the State Fair. There will be aquaculture (fish), corn, soybean, wheat, apple, mint, pumpkin, strawberries, tomato, beef, chicken/egg, dairy, sheep, swine, tree/hardwood, and wine farmers. They have graciously opened up their farms and businesses to tell their agriculture story, and each one will be showcased throughout many exhibits on the fairgrounds. Our Morgan County Fair is also honoring farmers, keeping with the same theme as the Indiana State Fair, “Year of the Farmer ­ Feeding America in the Past, Present, and Future”. The dates for our county fair are July 31 – August 8. There will be many farmers attending 4­-H livestock shows, walking through the Merchants Building and eating at the many different food tents. They will be more than happy to talk to you about what they do on their farms and in their fields. Attending our county fair is a great way to educate yourself on agriculture and the people that are involved in the industry that provides food for you and your family. We believe in the importance of educating others about farmers and our family farm businesses. We want you to understand how farmers have worked hard in the past and present, and how they will continue that hard work in the future because we need them to. Today, one U.S. Farmer feeds 155 people. In 1960, a Farmer fed only 26 people. 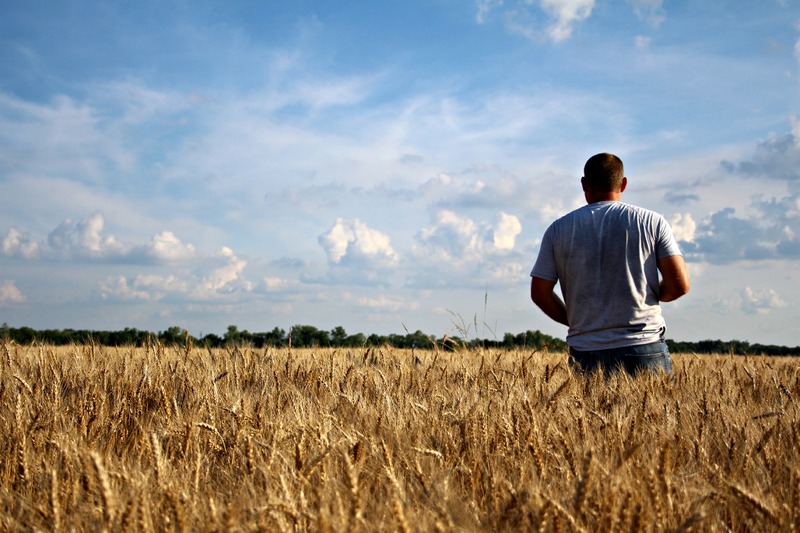 Farmers are producing more food on less land while using less water and fuel. They work extremely hard to make sure that we have a variety of safe food to put on your tables and theirs. 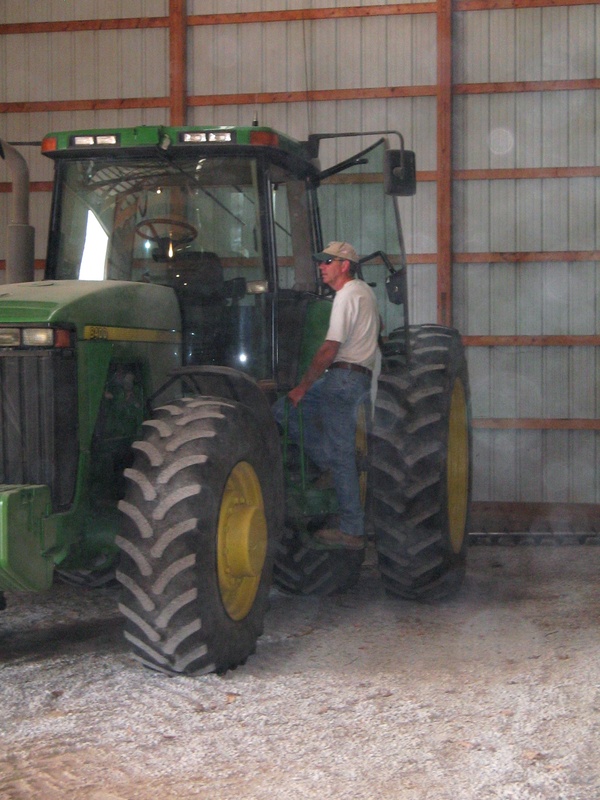 Farmers also understand that you, the consumer, may not know what exactly their job entails. They want you to trust them and know that they do have your best interest in hand because they also have to look after the best interest of their families. More and more farmers and farm families are welcoming people to take a glimpse into their world­­, their job and their livelihood, it’s one in the same. Forever our favorite farmer, our Dad, Tim Thomas. Agritourism is becoming more popular throughout our state. It’s when farmers open up their farms or facilities to the public to help educate consumers on where their food comes from and how it gets to our tables. With the huge disconnect among consumers to the family farm in today’s society, agritourism has become essential for farmers to showcase their businesses and livelihoods. Our county and state fairs are a great example of agritourism, but there are other agritourism opportunities that are available in Morgan County. Driving around our county you see the abundant corn and soybean fields, but there are other products being grown or raised in the county. You can go to Hunter’s Honey Farm to get local honey or to pick out and chop down a beautiful Christmas tree for your home. In the fall you can visit Anderson Apple Orchard for all your apples and to pick out that perfect pumpkin to create your Jack ­ o ­ Lantern. Visit Willowfield Lavender Farm to see the pretty purple colors and smell the aroma of lavender while touring the farm and purchase some of their lavender products. Morgan County is also home to many in the aquaculture business. Clear Creek, Curtis, and Ozark Fisheries raise their fish in the ponds you may see on your drive. The Morgan County Farmers Market is another great showcase of the products our local farmers work hard to produce. The market is open May ­ September with locations in Martinsville (Saturdays 9-1 PM), Mooresville (Tuesdays 3­-6 PM), and Monrovia (Saturdays 12­-3 PM). We hope that you are able to visit our great Indiana State Fair and the Morgan County Fair to show your support of Indiana Agriculture and to honor those hands that feed us, the American Farmer. 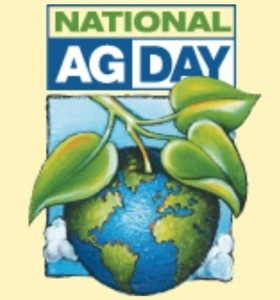 Happy National Ag Day! I am excited this year’s theme is “Agriculture: Sustaining Future Generations” because I get to work with our future generation almost every day. I am excited for their future and hope many of them choose a path in agriculture. I know my kindergarten, first, and second grade students are a long way from deciding what to do with their future, but it is my job to help lead them there. It just so happens I am a little biased about the opportunities ag has to offer them and will promote them as much as I can while they are in my classroom. 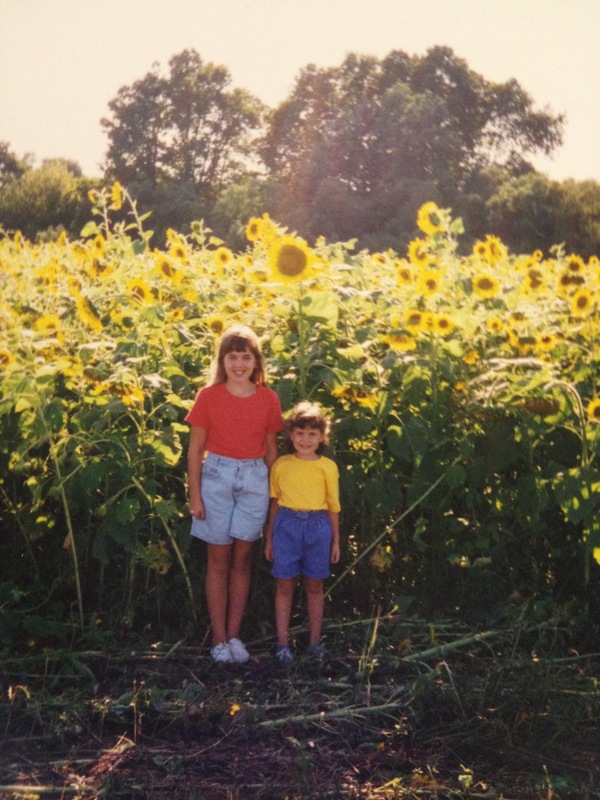 Below is a piece my sister, Katie and I wrote together. To sum it up, we ask that you join with us today in celebrating the past, present, and most importantly future of agriculture. As we praise the warm weather and new beginnings that spring brings, we want to remind you that our farmers are starting to gather in the fields to produce this year’s crop and the food that comes to your table each and every day. This year’s National Agriculture Day is March 18th and the theme is “Agriculture: Sustaining Future Generations”. This is a day to celebrate and support agriculture and the people that work in the agriculture industry even though we hope many of you celebrate more than one day of the year. 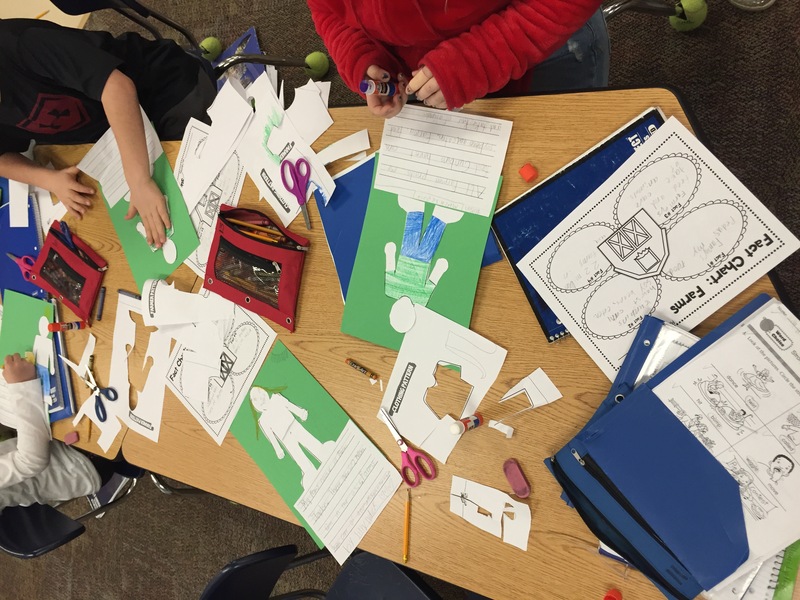 These “people” are the farmers and ranchers that grow crops, raise, and care for livestock and tend to the land. When we think of farmers, many times we think of overalls and a pitchfork. But in today’s agriculture world, more and more farmers are communicating via their smart phone from their tractors and using technologies that make our farms more efficient. The old pitchforks have turned into iPads. Even with the adoption of new technologies, we still face issues within agriculture. Many people outside the agriculture family don’t realize the issues we are facing today with aging farmers. Today, the average American farmer or rancher is 55 years old or older. Young people are not returning to the farm to work and take over the age-old tradition of farming. Instead they are looking elsewhere for more “attractive” jobs that have a typical 9-5 hour schedule, vacation days and less physically demanding work. This is everyone’s problem because we need the next generation of farmers and ranchers to raise our crops and livestock to sustain our lifestyles as consumers. With the world population expected to reach 9 billion by 2050, who will grow and raise our food? We need a next generation of farmers, ranchers and agriculturists to take on that task. Whether they come back to the farm or ranch to work, work for companies that create the technologies used on the farms, or help develop policies farmers and ranchers need to sustain their family farms, we need someone to take on the task. Also, we need people to teach the next generation about agriculture and where their food comes from. Without a doubt, there are many jobs that need to be filled in the agriculture industry. Living in Indiana we are lucky to have various options for the next generation to be a part of this agriculture family. We have a strong agriculture sector ranging from a leading land grant university that provides educational and extension services to every citizen and a growing technology and innovation sector that includes companies like Dow AgroSciences and Elanco. We also have seed companies that provide more innovative agronomic tools for our farms and a livestock sector that provides food to people around the world. Our Indiana agriculture sector generates more than $25.4 billion towards Indiana’s gross domestic product and employees more than 475,000 Hoosiers, which attributes to roughly 20% of our workforce. So how you can you help find the next generation of farmers, ranchers and members of the agriculture family? Encourage a young person to learn more about jobs in agriculture. Attend a forum or meeting that discusses ag issues and policies that affect our farming and our food. Visit local events, county and state fairs and farms to show your support of famers and ranchers. Educate yourself on local, state, national and world food and ag issues. Support your local FFA chapters, 4-H clubs, or young farmer groups. Let them know that they are needed and that you really need them too. Agriculture is a part of our heritage and we hope it continues to be a strong part of our future in Indiana and in our country. As farm girls who wore overalls, loved showing animals and eating sweet corn from our own farm, we hope you take a moment to celebrate National Ag Day today and every day with us. Do your part in sustaining agriculture’s future generations which include you too. As I pulled into the parking lot looking for a place to park I found many trucks taking up most of the spaces. These trucks had front license plates that read, “Got milk?, BEEF, Boiler Up!,” or the FFA emblem. This was the first sign that I knew I was in the right place. We also had the opportunity to help fellow hungry Hoosiers by packing 30, 888 meals for Pack Away Hunger. To me this was such a special moment during the conference. 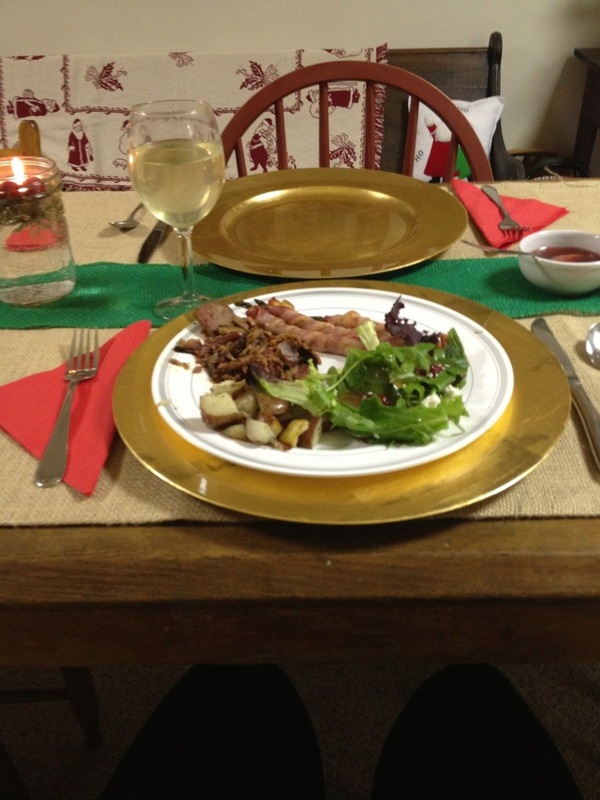 I was in a room creating these meals with people that grow and raise food. Without them that moment wouldn’t be possible. This is one of many reasons I enjoy being a part of the Young Farmer group. 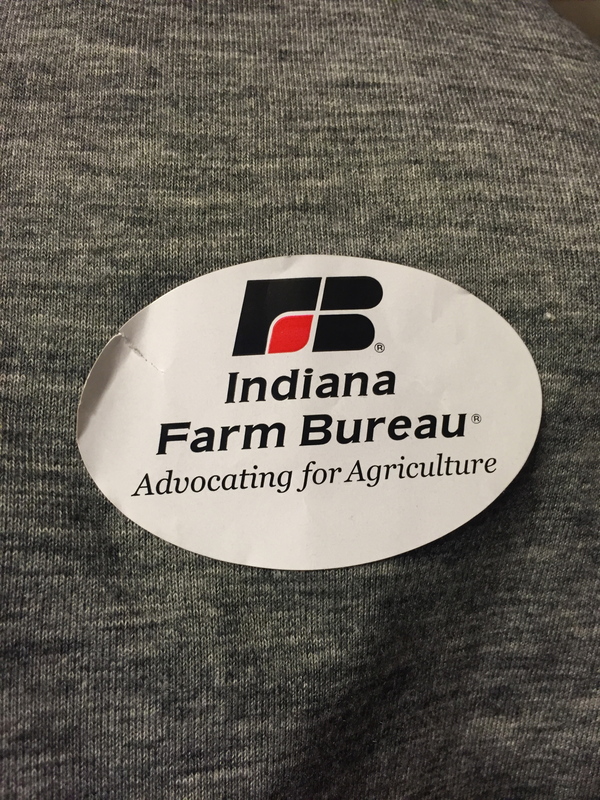 It is not only a group of people that share a similar passion for agriculture, but it is also a service group. We work together to make a positive impact for our communities. 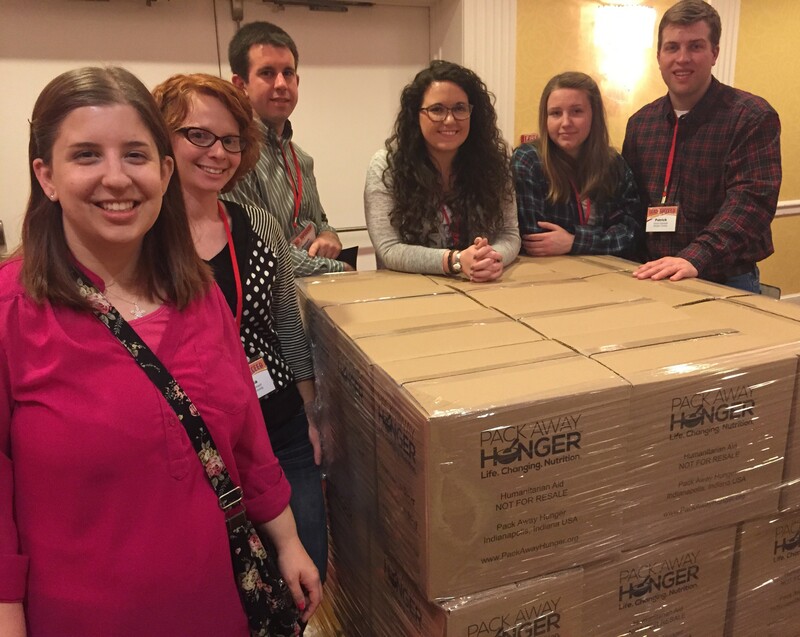 Morgan County Young Farmer members with packed boxes of meals for Pack Away Hunger. 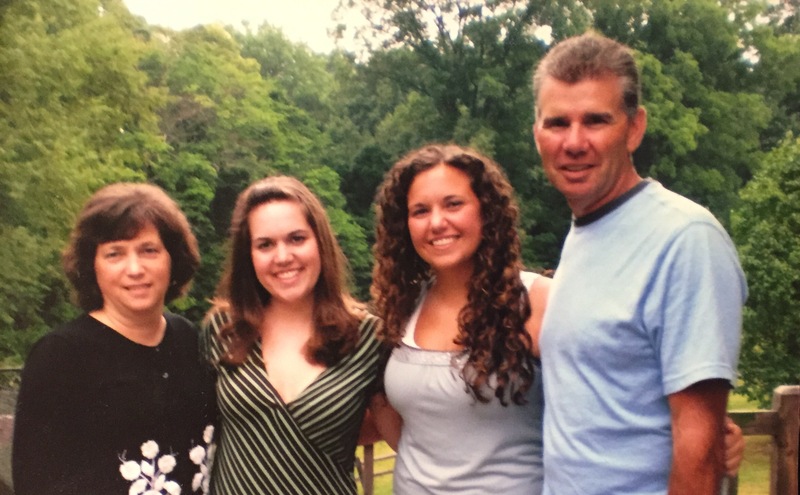 Read more about Barnes’s recipe for creating great moments more often by jumping on over to my friend and fellow Young Farmer member, Chelsea Nord O’Brien’s (she recently got hitched, but will forever be Nord to me) blog, Boilermaker Ag. “Like” Boilermaker Ag and Young Farmers of Morgan County on Facebook to stay up to date on Agriculture industry news and what’s happening with the Morgan Co. Young Farmers. To sum it up, work on creating great moments more often and always remember to thank a Farmer! 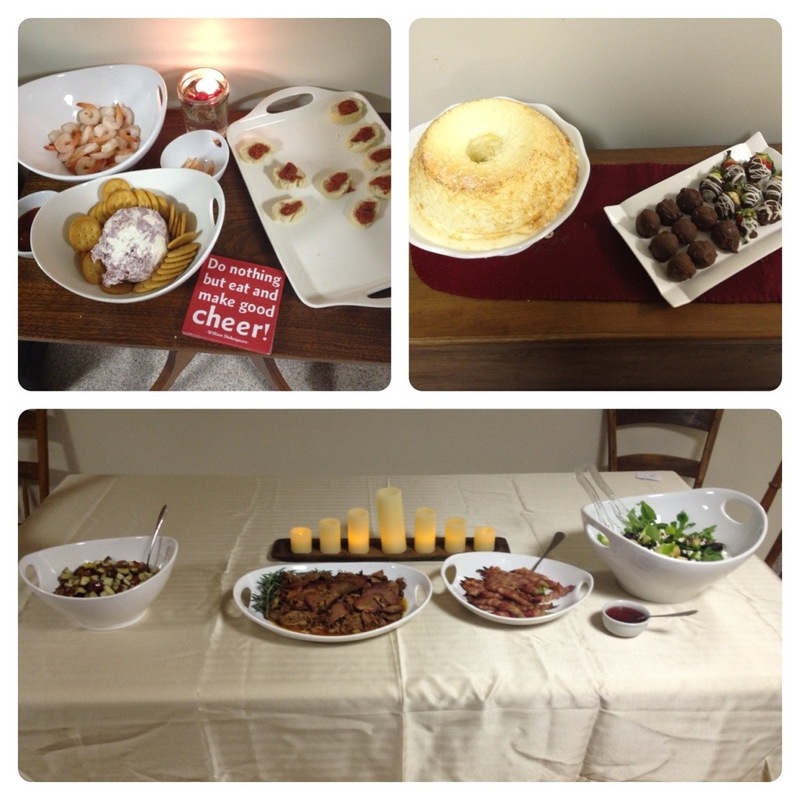 Last Saturday I hosted a dinner party for some of my favorite people (some of them could not make it because it is the busy holiday season after all). I love when we are all home and together. 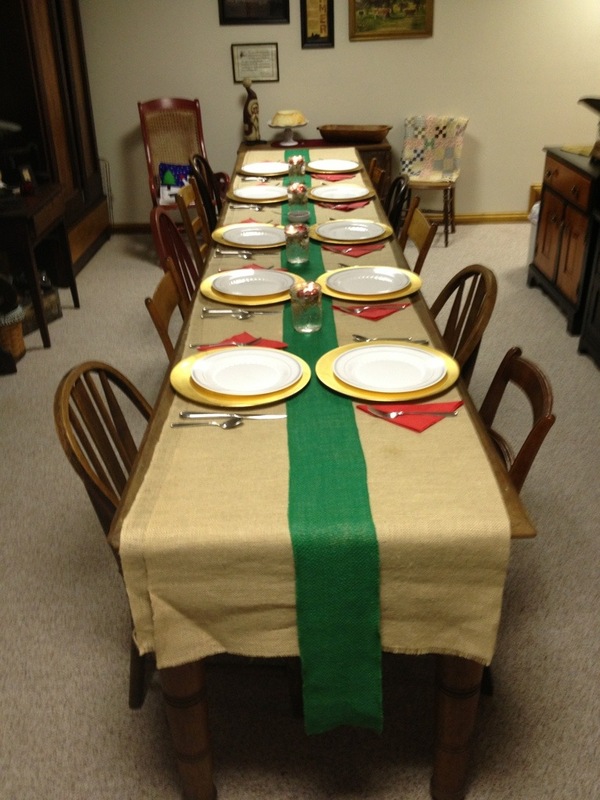 I especially love when we share a meal and conversations around the table. Moments like these are my favorite. And because it is 2014 we had take a group selfie and commemorate these moments with a hashtag, #CountryCocktailParty. The “country” part is for the location (my house is in the middle of nowhere), “cocktail” because we needed a fancy word, and “party” because it was a dinner party. We got dolled up for this #CountryCocktailParty. We put on heels, did our hair, and wore lipstick. 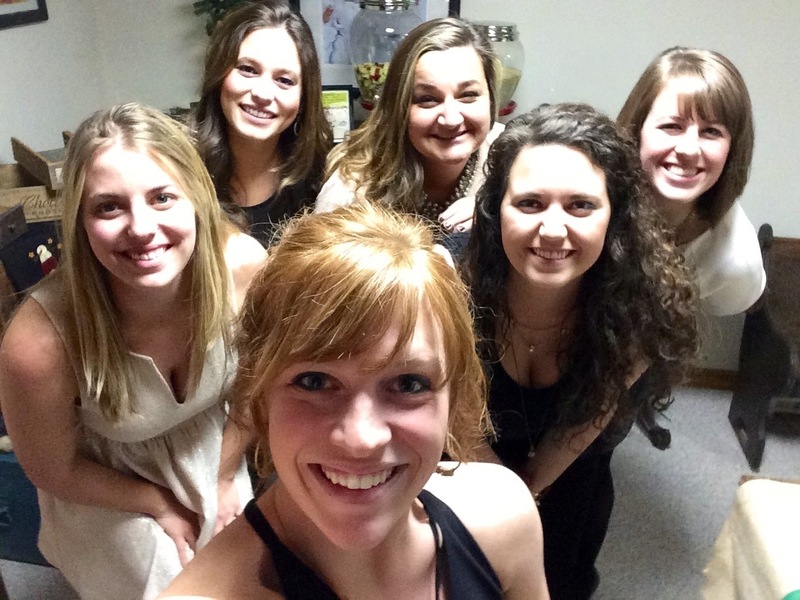 We did it to feel “fancy.” We didn’t do it to impress boys. Although there was one boy in attendance. We call him TA. He is boyfriend to one and friend to all of us. He is a champ for putting up with our ridiculousness, which is why I think we accept him into our group. Back to the ladies of the evening because that’s what we like to think we are for this fancy feast. 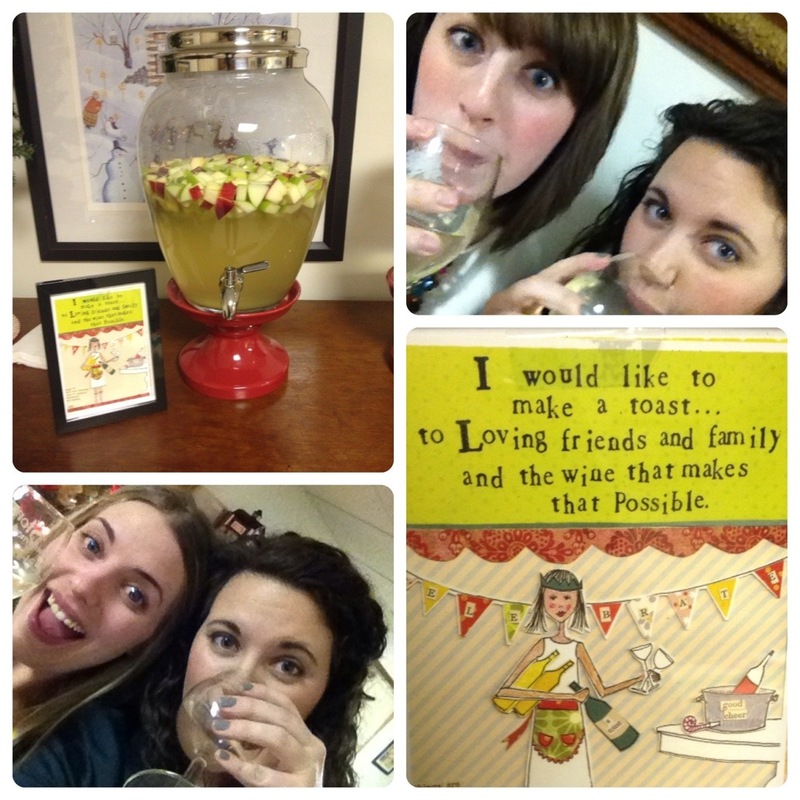 But first we toasted! We toasted to us, the best of friends. 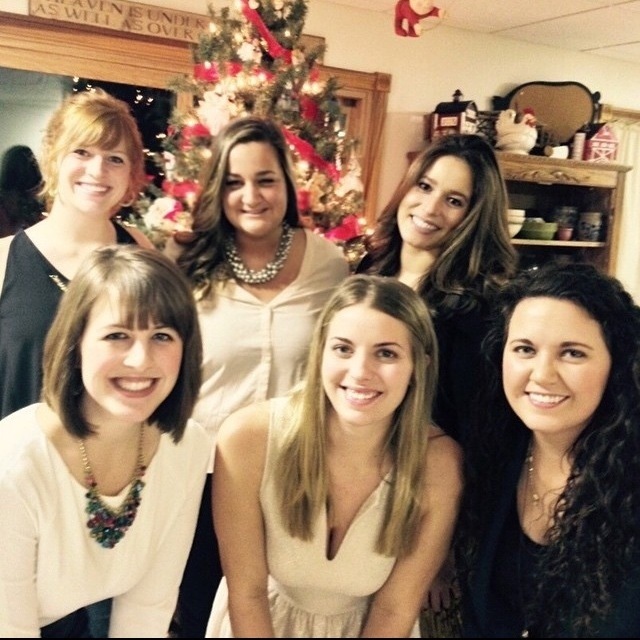 The best of friends that have endured saying goodbye to old jobs and accepting new ones in 2014, to moving into new apartments in new cities and for some in new states. For some 2014 was filled with saying goodbye to old boyfriends and loved ones and hello to new family members and maybe future beaus. Many of us took road trips together throughout the year. Whether it was across other states or just the back roads of our beautiful flyover state. Our 2014 was filled with many things that everyone experiences, but what made our year different? We had each other every step of the way. 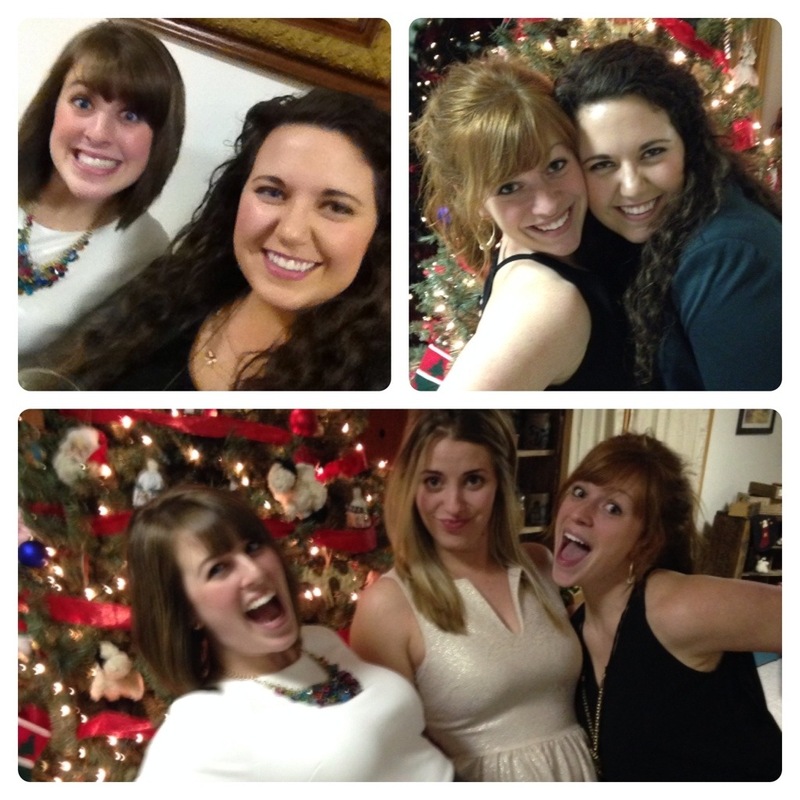 This group of ladies made my 2014 significant. They inspire me to be myself and to step into those not so comfortable zones. They make me proud of where I come from and where I will go next. They also make me sad at times. Sad because we are all traveling on different roads that will lead to different endings. But I am learning that it’s okay. It’s okay because God has a way of always crossing our roads when we need it most. 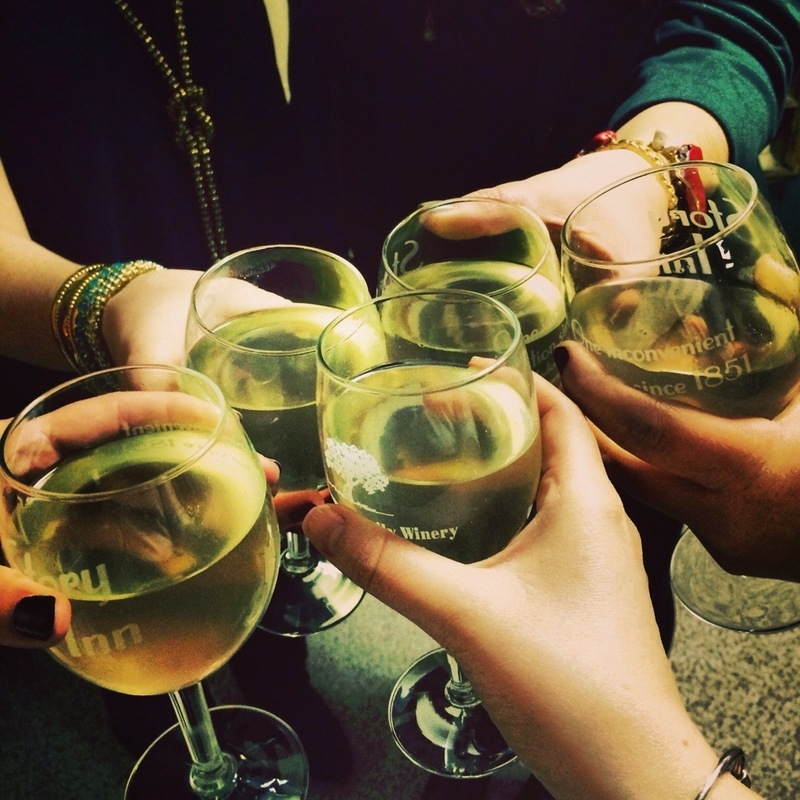 To sum it up, Cheers to 2014 and to the ladies that made it possible! I love you all and I can’t wait to see what 2015 has in store for us!